Gerrymandering: Because, why should voters choose their representatives, when representatives can choose the voters? Imagine North Carolina as a puzzle. Jagged lines are drawn across the map, spreading across counties like greedy fingers and into neighborhoods like silent snakes. North Carolina, and many states across the country, has these oddly shaped voting districts that end up making impossible puzzles of themselves. In most states, politicians have control over how they draw the maps that separate voters into districts. This essentially means that they have control over who votes for them, they draw maps that make it virtually impossible to lose, and they strengthen or weaken the power of specific groups of people. This process is infamously called Gerrymandering. 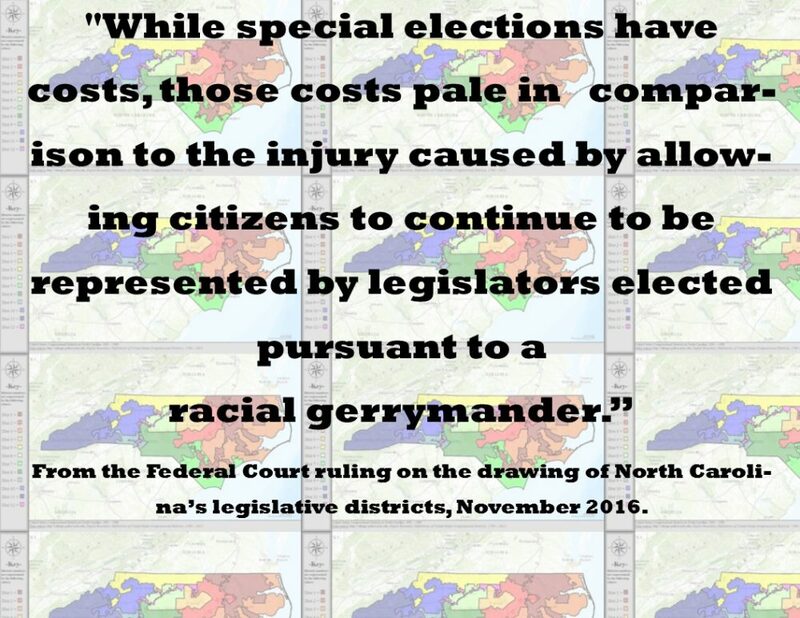 The voting districts of North Carolina have always been politically contested, but there is growing people-power working across bipartisan lines to support the drawing of fair electoral maps. We are making progress. 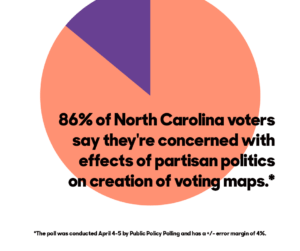 In a recent partnership with Democracy North Carolina, we have joined a statewide coalition to campaign for fair maps in our state. Democracy NC has shared with us the data and in turn we have shared our experiences and connections in the county. Many statewide campaigns have had success doing traditional canvassing in middle class, urban or suburban areas, but North Carolina is a low-income and rural state. 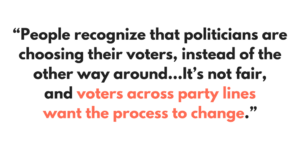 So we combined our low-income, rural organizing models with Democracy North Carolina’s research and materials. We incorporated their data, and they incorporated our language and knowledge of turf. Four of us got together Saturday, April 29th at the Swannanoa Library. We started with a training about what Gerrymandering is, what it does, and how it hurts democracy. We then asked the group if anyone was from the area, and went over a brief introduction to the area. We talked about the industry that has come and gone, the class and cultural shifts over the years, and described the physical terrain of the area. We explained that we would be walking on roads without streetlights, without sidewalks, and with plenty of dogs running loose. We reviewed the materials that we would be sharing in the community, and made sure they were understandable. We spent extra time on the postcard we were giving to neighbors. The postcards include space for people to write their personal information on a petition to send to legislators urging them to support fair electoral maps (click here to download the postcard for your own use). We then did a role-play of knocking on a door, to familiarize people with the process. Two pairs of us went up parallel streets stemming out from the library. Over the course of two hours, we met several dozen community members. Out of everyone we spoke with, only two people declined to sign a postcard. People became very interested when they heard it was a nonpartisan issue, and that there was legislation in the North Carolina Legislature supporting the possibility of fair maps. I was particularly inspired by the few folks who had never heard of the issue before, but became passionate through our materials and conversations, and signed a postcard to their representative. The more public support we can get behind an issue, the more likelihood we have to change policy. It might sound like a small event on Saturday April 29th, but it enlivens and awakens the public perception and outcry about equal access to representation. If we win fair representation, we are all the more likely to win on issues we care about. Gerrymandering sits uniquely positioned as an issue that is the key to unlocking our ability to hold representatives accountable for their decisions on behalf of their constituents. We are planning several more canvassing dates around this issue. Stay tuned with us and Democracy North Carolina to learn about canvassing opportunities! This project will impact the 2020 elections immensely. And as we’ve seen in the past, the ability to have equal access for North Carolinians at the ballot box has a huge impact on national elections. We are moving our state and country forward when we fight for fair maps. To become involved contact us. Update 05/24/17 – Since posting this blog, the SCOTUS has agreed that North Carolina has gerrymandered districts along racial lines – SCOTUS Blog and Reuters. Lia Kaz currently serves as the North Carolina Community Organizer for Spirit in Action’s We the People: Working Together (WtP) project. Through the WtP project she organizes in low-income, rural communities across Buncombe County to empower civic engagement. She has a Bachelor’s degree in Social Work and won the Alton J. Pfaff Award from Warren Wilson College, which recognized her as the graduating student who most exemplifies the triad of Academics, Work, and Service. She currently lives in Asheville with some great roommates, and a perfect dog named Mona. ­We have seen the incredible reactions across the country as stories of Philando Castile and Alton Sterling have gone national. You may have also heard about Vinson Ramos, Melissa Ventura, Anthony Nuñez, Pedro Villanueva and Raul Saavedra-Vargas who have also been killed by police—just last week. Our country had long-lasting, multiracial gatherings and calls to justice after the shooting of 12-year-old Tamir Rice, the shooting of 18-year-old Michael Brown, and the shooting of 17-year-old Trayvon Martin. Alongside the hope and power of the communities gathering together, we also feel the insidious silences that can follow untold stories of violence. Many times, stories of police violence and racial profiling do not become national news. A recent killing in Asheville, North Carolina is a perfect example. We lift up the name of Jerry Williams. Jerry was born on July 12, 1980 as Jai Lateef Solveig Williams. He was shot and killed by Tyler Radford of the Asheville Police Department on July 2, 2016. He was a human being, a son, a father, and a friend. We have not received much national news, and even our local news sources have failed to publish the written accounts of many eye-witnesses or the family. There was an alleged 911 call with a complaint of a black man in a white car shooting a gun through a public housing neighborhood, and when Jerry was confronted by police, he was shot 7 times. They claim that he had a large gun, and that he was fighting with a woman in the car. I probably don’t have to tell you about the public narrative, and how it has aimed to soil Jerry’s moral character. That story is already very old—several hundred years old. There seems to be a narrative in this country that if a person is deemed “dangerous” in the ways that we have perpetuated since the original colonization of this country, they lose the rights to a legal council, trial, judge, or reformation and become subject to public execution on sight. Our country’s outcry at the loss of justice is loudest with cases captured by video evidence, when “he was doing nothing wrong” or “his hands were up”. Those are relevant and important pieces of the puzzle, to be sure, and yet, it is far too easy to tell the story of a “dangerous black man” in America. We have yet to see any video footage of Jerry’s death. Witnesses have told the public that they filmed the incident on phones, but that their phones have been confiscated by police and have not been returned. The police did not wear body cameras, and the dash camera on the police cruiser apparently was not on. Deaverview Apartments, where Jerry was killed, have surveillance cameras like all public housing, and yet, police maintain that no video footage exists. In a national context, it’s important to remember that the man who filmed Alton Sterling’s murder has recently been arrested on trumped up charges. We know this trend, as a country, very well. We need to be vigilant in cases where evidence goes missing or the witness is punished. Days after Jerry was killed in Asheville, North Carolina Governor Pat McCrory signed into law House Bill 972. As of October 1st of this year, law enforcement video recordings will no longer be part of the public record and the public will be prohibited in viewing the recordings unless they are able to overcome significant legal impediments. Individuals on camera and those directly involved in the cases filmed will be permitted to view the footage if they come to court. “My goal,” McCrory claims, “is to protect those who protect us.” In response to the growing evidence that our communities of color are disproportionately at risk, our Governor has chosen to limit the evidence. The ACLU of North Carolina has already called this law “shameful.” I cannot imagine the audacity that our legislature has to argue the validity of lethal force, while concealing its practices from the public. There comes an awful conflict—we should not need to see the footage to believe our hurting communities. And yet, we cannot deny that the public outcry has been amplified with the ability to bear witness, and share the truth. As long as our country operates on deep seeded biases, and under-supported and often times traumatized officers have to make split-second decisions with a gun in their own hands, we will see disproportionate rates of violence. And the system is very busy protecting itself. Click here to find the published accounts from witnesses, family members, and Asheville Black Lives Matter. Lift up their voices, and their needs. You can share this on social media, in your hometown, and with the political leaders of Asheville. I urge you to use your voice. You can also help the family raise the necessary $5,000 for a second autopsy of their loved one, here https://www.gofundme.com/2d7rryrr. If you contact any or all of the above Asheville officials, remember to remain respectful but get your point across. Thank you.